Resident Evil 2 is a staple of the long-running survival horror series, but to this day it's still without its own HD remake. Independent developer team InvaderGames seeks to change that with its unofficial, non-profit release of Resident Evil 2 Reborn, an HD update (via Kotaku) of the game featuring brand new textures, particle effects, 3D models, and a swath of new content. It's absolutely impressive what this doggedly determined team have been able to put together, especially since Capcom is notorious for shutting these types of projects down left and right, but won't take the steps to go ahead and remaster the rest of the series. Luckily we did see a recent HD update in the form of Resident Evil HD, so perhaps we might also see something similar happen with Resident Evil 2 now that fans are taking it upon themselves to make it for the audiences online who are so vocally clamoring for it. The Resident Evil series is universally loved for its healthy mix of survival horror, puzzle-solving, and copious amounts of action to get your blood pumping. It's also responsible for more than a few instances of shocking, heart-stopping moments that linger long after you turn off the game...and creep right into your nightmares, for that matter. Resident Evil 2 has a special place in the hearts of many a survival horror fan out there as well, with its narrative including both Leon S. Kennedy and Claire Redfield, who's on a mission to find her brother Chris. 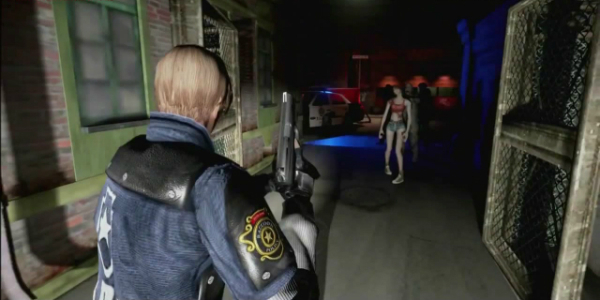 Both Leon and Claire head to the Raccoon City Police Department together after being flooded by zombies during the T-virus outbreak, and things spiral out of control from there. This entry in the series is regarded as one of the best in the Resident Evil continuity, and released to positive reviews from players and critics alike. This project will no doubt see an outpouring of support from the gaming community. Let's hope it has enough time to come to fruition, especially since it's so great-looking.